Win Scooby-Doo! 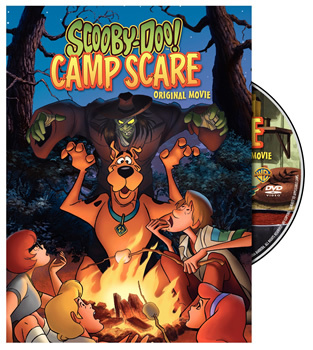 Camp Scare on DVD! Scooby-Doo first appeared in 1969 in the Scooby-Doo Where Are You! Saturday morning cartoon series; written by Ken Spears and Joe Ruby. Scooby, Shaggy, Velma, Freddie and Daphne travel the countryside in their van, the Mystery Machine, solving mysteries and uncovering criminals who are often disguised as ghosts, ghouls and other unworldly monsters. The characters have seen many incarnations on CBS, ABC, Kids’ WB/The CW, Cartoon Network, and Boomerang. There have also been movies featuring the antics of everyone’s favorite crime-solving gang! Warner Bros. has just released a new direct-to-DVD movie called Scooby-Doo! Camp Scare. The story finds our heroes getting back-to-nature at Camp Little Moose, surrounded by friendly counselors, fun activities and, of course, plenty of ghost stories around the campfire. The only trouble is that every time a ghost story is told… the creature comes to life! Voice actors for the gang are Frank Welker (Scooby-Doo and Freddie), Matthew Lillard (Shaggy – the role he’s played in two live action features), Mindy Cohn (Velma), and Grey DeLisle (Daphne). Other voice talents include Dee Bradley Baker, Mark Hamill, Phil LaMarr, Scott Menville, Stephen Root, Tara Strong, Lauren Tom, Selena Gomez, Demi Lovato, Tyler James Williams, Jennifer Morrison, Erik Knudsen, Nina Dobrev, Tim Conway, Bethany Joy Galeotti, and Sophia Bush. The DVD also includes special features; a bonus episode from Scooby-Doo! Mystery Inc., and Scooby-Doo! Camp Stories – Solve Spooky Mysteries. You can purchase Scooby-Doo! Camp Scare for $14.99 from Amazon. You can also try to win a copy here. To enter, you need to merely post a comment below. Be sure to leave your email address so that we can contact you with the good news if you win. You can enter once per day. Guidelines: This giveaway is open to participants with a United States mailing address only. (International readers can enter if they have a friend in the States who can accept their prizes by mail.) Many may enter but one person will win. You must be 18 and older to enter and no purchase is necessary. Contest ends October 10, 2010. UPDATE: Congratulations to “Jordan” who won this DVD in our contest. Thanks to everyone who played and we’ve got more contests coming! Hey Scooby Doooooooooooooooooo is where it’s at. coming out with a new movie later this October. Ugh I can’t wait. I also want to say that Scooby doo is my biggest fan and that I love him so much that I would trade my life for him! I wanna have this Scooby Doo!!! We love Scooby-Doo and the gang! My wife and I grew up watching Scooby-Doo in all the different series. My daughter has grown-up watching the reruns on VHS and now dvd. We even like the new Scooby-Doo Mystery Incorporated series. Watch it every week. Getting use to the new look even. Hope the gangs new Cartoon Network movie is as good as the last one. We loved it far more than the theatrical live action movies. Scooby-Doo is always funny and even sometimes kind of scary. I can’t wait to see how good this movie is!!! hoping that i win this…. Scooby Doo is my hero!